We are born to observe, learn from and freely explore the world around us. Play is departure from the routine that arouses curiosity, delight, and a feeling of fun. We play with thoughts, things and each other. We learn through active play that is structured (with rules and outcomes) and unstructured (open ended exploration). Our exploration nurtures our curiosity and our need to know. There are many kinds of play and play evolves differently in different culture. There is play with materials and nature called sensory play or free exploration. Building and creating is constructive play. Dress up or fantasy is dramatic play. Game play offers endless variety of play with and without props. 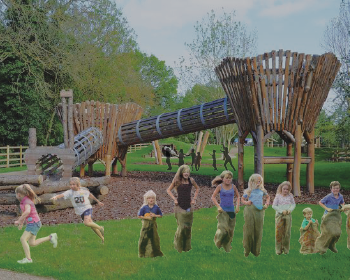 Functional play is active play- running, sliding, climbing, etc. 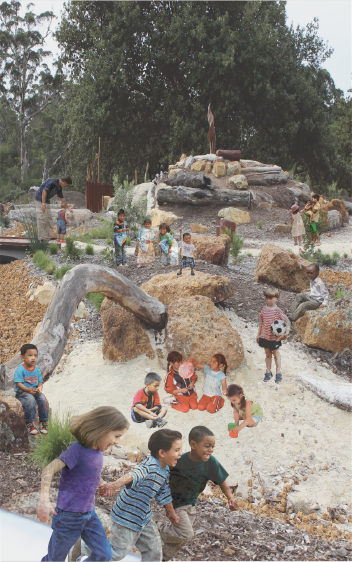 Play is fun, but it is also vital adaptation to our environment. It prepares us for life, translates and transcends conflict and helps us develop socially, emotionally, cognitively, and physically! 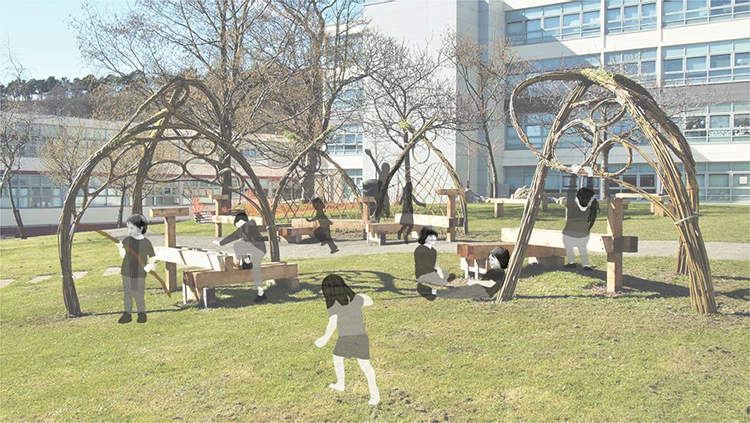 Functional play is derived from spaces to play. When there is flat open ground we feel free to run. When there are stairs we can climb up and climb down. When there are slides we can slide to the ground. Tunnels invite us to crawl. Mazes and obstacles courses are good examples of functional play. They invite us to move freely. We develop motor skills by running, jumping, skipping, climbing, and yes, falling! We become spatially aware of the world around us and socially aware of other people’s territory and movement. We develop balance and confidence in moving through space in different ways. Make a photo chart of different functional play activities and record in a sketch the places where they could be played. Go outside and play! The oldest playground for people is the great outdoors. That means the earth, mud, soil, rocks of the ground. Trees, bushes and plants, insects, birds and animals all contribute. We learn to solve problems and think critically about cause and effect as we play with water, build rock towers, use sticks to make a dam. Where can you first remember exploring outside? What was amazing to you? Did you build a mud dam? Did you leave a rock trail? Were sticks used to create an enclosure? Did you peer into blades of grass to find the miniature worlds within? Where can you find places to play in nature? List them and make small sketches. Constructive play gets our natural genius going! A kit of parts, sometimes called ‘extra parts’, when made available offer free form making and exploration. 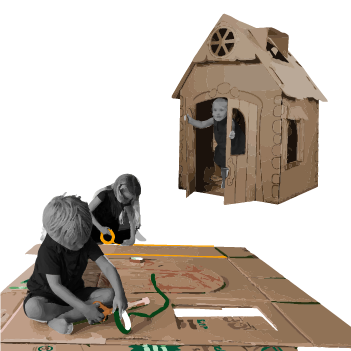 Extra parts can be as simple as cardboard boxes and sheets. They can be pieces of wood and plastic, wires and screws, nails and hammers. The act of building develops our cause and effect understandings and sharpens our responses to changing input and new challenges. Look at the Rube Goldberg Challenges and Caine’s Arcade. Games are activities with rules and expectations. They can be spontaneous or ancient activities handed down over the centuries. Stick and ball games are common across many different cultures. Tag and hide and seek are games that can be played indoors and well as well as out. Some games require props such as die, cards, or a playing board. Other games like soccer, basketball, football, rugby and lacrosse require a plying field or court. Game play can be done individually and/or in teams. Make an alphabet of different games to play. Be game. Play a game! Dress up! Dramatic play or ‘make believe’ involves fantasy play. From puppetry to skits to stage productions, play acting allows us to become other characters and to watch other characters in action. Finger puppets are a fun and easy way to create characters and put on a miniature play. Pick or story or make one up to narrate and have finger fun! Collect discarded materials as props and create a costume for an animal or a character in a play. Make a puppet stage. Put on a play! Post drawings or photos of your production with three sentences about it. 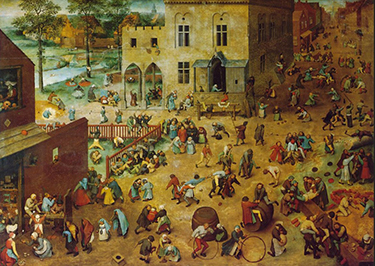 Historians have identified over eighty children’s games in this painting from 1560 by Pieter Breugel The Elder. How many can you spot? You can compare your list with the games included here. Draw a picture of your own of playtime! Balance and motor skills, including running, jumping, skipping, and climbing are best developed through which kind of plays? 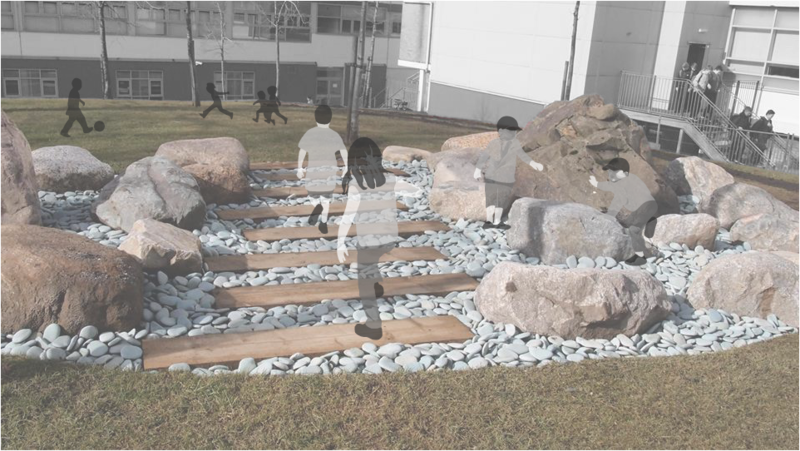 Which professionals help to create play yards? A stuffed animal makes an excellent prop for which kind of play? Acorns, a stream, rocks, and twigs make which kind of play possible?